Some artists might feel that they are coming from a completely irrelevant background from CG. But their background might be contributing--more than they realized--to what they are doing as a digital artist. Check out the work of this week's winner. Were the immaculate details of the electronic good a coincidence? Probably not. So, it is with great pleasure that www.BlenderNews.org introduces to you the winner of the Render of the Week Award for the week of January 29, 2018: Timofei Shcheglov. My name is Timofei Shcheglov and I live in beautiful Russian Siberia. I was educated as an electromechanical engineer, but as it turned out it wasn't exactly what I wanted to do in my life. So now I'm a self-taught digital artist. The idea came to me after I had read the well-known "IT" novel by Stephen King. I thought then: what if the heroes of the novel (spoiler alert!) hadn't killed Pennywise in 1985, and it would return in around our time. The image was made in Blender and Substance Painter. I used Blender for modeling, UV-ing, sculpting (both rough with Dynamic Topology, and final with MultiRes modifier), for rendering (using Cycles), compositing the final image, and even for editing the "making of" video. 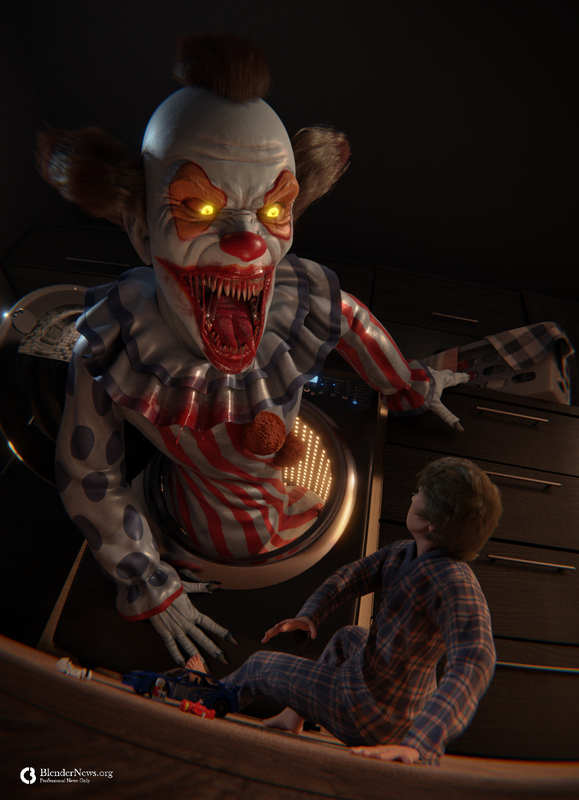 In Substance Painter I painted the textures for the clown and the boy. I also used a couple of other open-source programs: Inkscape for text work on the washing machine, and Krita for sketching, brainstorming, and general editor for working with reference images.